From Western China all the way to Istanbul, Turkic people roll out dough, fold it into small pouches, boil it and call it mantı. When it comes to dumplings, Turkish tradition dictates that the tortellini-like mantı be no larger than peanut-sized. With its unusually large (and sometimes fried) dumplings, Bodrum Mantı & Café has taken traditional Turkish mantı to soaring new heights, of which we strongly approve. Don’t be put off by the modish décor, the dour bow-tied waiters or the high street address; this is the real article. This 24-hour Arnavutköy staple with a Bosphorus view never fails to serve it up hot, fast, good and cheap. The içli köfte – boiled or fried bulgur and ground meat football-shaped patties – is always made to order, unlike many oil-soaked renditions found around town. Stick a fork in the çiğ börek and watch – or, better yet, smell – the hot, airy pocket pastry deflate in an aromatic whoosh, revealing a light filling of ground meat. Like the mantı, these appetizers come jumbo, so be forewarned. The mantı is offered in a few varieties: whole wheat or white dough, boiled or fried. When it was fried, we couldn’t discern the wheat from the white dough, but in boiled form the whole wheat offered a pleasant change. Ordering half portions allowed us to try many combinations of fillings and toppings. The pièce de résistance – temel feriye mantı – is fried just enough for the thin shell to crisp up and the stuffing of spinach, onions and cheese to meld nicely without being greasy. This mantı even holds up well under a generous topping of garlic yogurt sauce. Supermantı, indeed. Ok, Bodrum manti is fine. 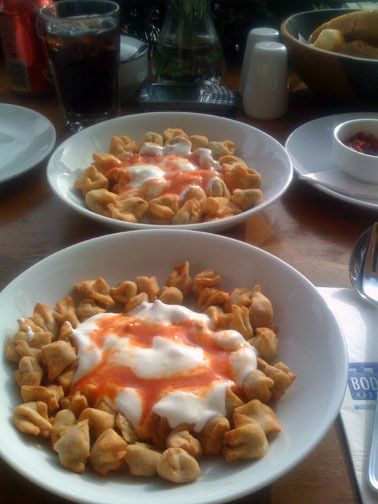 But if you want to taste the best manti in Istanbul, it is Kardesim Manti in Emirgan Cinaralti. You have to try that! My internship is about to finish, so let me thank you for all the wonderful suggestions you’ve provided. I’ll go home soon, but not before my family comes for a visit. I was going to take them here, but I wanted to make sure that there are vegetarian manti available. My parents don’t eat meat, but dairy is fine. My Turkish friends told me there is no such thing as vegetarian manti, but your review made it sounds like there was. Your assistance would be appreciated. Thank you again for all the excellent recommendations! There certainly are vegetarian options at Bodrum Manti. But if you want to go a little more upscale in the same neighborhood, we recommend a place called Melengec. This is a vegetarian dream. It is all traditional Aegean food with an incredible selection of greens, squash blossom dolma and eggplant tempura. We plan to review it soon, but I thought you might appreciate the tip. it wouldn’t be the worst idea to get a round of manti at Bodrum Manti and then head over to Melengec for a sit-down dinner. You might want to call Melengec for a reservation. Enjoy. And please, report back. Thanks so much for the suggestion and responding back! I’ll let you know what I end up doing, we might be going to Asitane for lunch which is why I wasn’t too worried about doing a simper dinner, but I’ll certainly keep it in mind. By the way, if you’re ever in New York or coming for a visit, please e-mail me. I’m a life-long New Yorker, so I’d be happy to share my tips on the city including a recently compiled list of all my favorite restaurants. You’ve really made my time in Istanbul very enjoyable! Thanks again and happy eating! Feriye manti for two, nothing else, cost 25YTL this afternoon. That’s like $12 for a handful of food. It is delicious– super delicious– but cheap it ain’t. This is the manti I dream about. I used to eat here at least once a month when I lived in Istanbul. I took every visiter I had to this restaurant and we all still have their magnets on our respective refrigerators.